The turmoil in Egypt turned increasingly violent on Monday when Egyptian soldiers fired on hundreds of supporters of deposed President Mohamed Morsi, killing at least 51 civilians. The violence followed a chaotic political week in which two of the key players – both unpopular with the Egyptian public – illustrated the difficulty in finding a leader who can overcome the country’s divisions. Egyptian state media had reported on Saturday that Mohamed ElBaradei, a Nobel Prize-winning former diplomat regarded as a liberal and secularist, was in line to become interim prime minister. But that appointment was soon derailed by objections from the conservative Islamist al-Nour party, which had provided cover for the military by backing the ouster of Morsi. Neither ElBaradei, the National Salvation Front party (NSF) to which he belongs nor al-Nour are regarded favorably by the Egyptian public, according a Pew Research Center survey conducted in March. Over half (54%) regarded ElBaradei unfavorably, compared to 40% who had positive views of him. Similarly, Egyptians regarded the NSF unfavorably by a 52% to 45% margin, and al-Nour unfavorably by 52% to 40%. In fact, the data appear to mirror the factions on the streets of Tahrir Square – not a single leader seems to capture overwhelming favorability from the public. Ironically, despite Egyptians’ increasingly glum mood about the economy and pessimism about the future, only Morsi and the now-embattled Muslim Brotherhood received on balance positive marks from the public in the March survey. 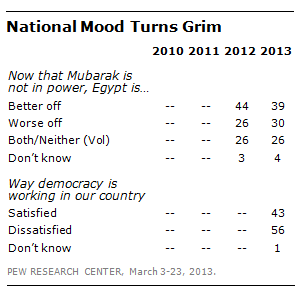 Yet, Morsi’s positive ratings were not overwhelming either – 53% saw him favorably, 43% did not. Egypt’s Supreme Council of the Armed Forces that took over Morsi’s government, was seen favorably in March by 67% of the public. The only other figure or institution that enjoys support from a sizable majority was the Muslim Brotherhood (63%). But that figure represented a decline from 75% in 2011 and 70% last year; and, the ratings of the Freedom and Justice Party, the Brotherhood’s political wing, were about the same as those of Morsi – about half (52%) seeing the party favorably and 44% regarding it unfavorably. The standing with the public of Egypt’s interim president, Adly Mansour, is also uncertain. Mansour had been the head of Egypt’s Supreme Constitutional Court, an institution regarded favorably by 50% of the public and unfavorably by 47%. A key factor in shaping political attitudes are the beliefs among Egyptians about the proper role of Islam in politics and the country’s affairs. More than seven-in-ten (72%) of Egyptians who believe the country’s laws should strictly follow the Quran have a favorable view of Morsi, who came to office with the backing of Islamist groups. Just 23% of ElBaradei followers hold that view, with 64% saying laws should only follow the values and principles of Islam and not be influenced by the Quran. Among FJP and al-Nour supporters, large majorities say the country’s laws should strictly follow the teachings of the Quran, while less than half of NSF supporters agree. NSF supporters are also much less likely to favor Egypt’s new constitution, whose passage in 2012 was seen as a victory for Morsi and his supporters. The divisions between the Islamists and secularists are evident in other measures. About half of those who have a favorable opinion of the Muslim Brotherhood-affiliated FJP and the Salafist al-Nour party are satisfied with the country’s direction, while only 20% of those having a favorable view of the relatively secular NSF share this view. One result of the continued political instability is that a majority (56%) of Egyptians said in March they were dissatisfied with the way democracy was working compared to 43% who said they were satisfied. And, perhaps even more telling was the finding that only 39% said Egypt was better off without deposed leader Hosni Mubarak compared to 30% who said the country was worse off (26% answered “both” or “neither”).